Little Sis spent an hour at nursery this morning. When I went to pick her up she looked like she was having a great time. On her next visit she will be having lunch and soon she will be attending for a full session! Whilst I took her to nursery the toddler was having fun at home with nanny. In the short time we were gone they had made orange slices to hang on the Christmas tree, decorated some gingerbread people, also for the tree, and finished off the little Christmas tree he began on Sunday. 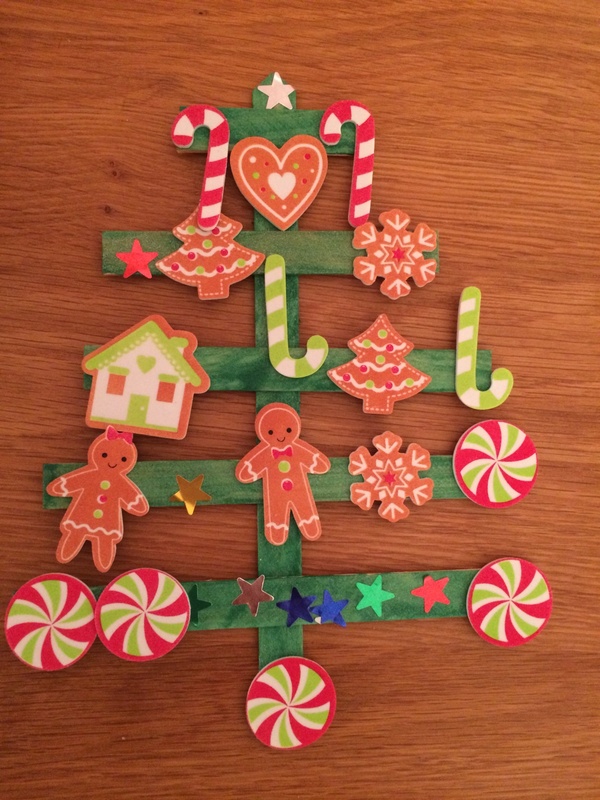 The tree is made from some large craft sticks which the toddler had already painted green and then we glued the branches in place. This morning I left him a bag of stickers to decorate it as he wished. He was really proud to show me the finished decoration and I think he did a great job with his stickers. He has already asked what we’re making next! Elaine Livingstone recently posted..My” festive face off” challenge. This is so cute! Stopping by and pinning from the Monday Parenting Pin It Party! Happy Holidays! how sweet. Thanks for joining in the monday parenting in it party. This tree looks lovely. A great little craft for Christmas. I have pinned this to Festive Morkus.